Some people really don't understand the necessity of having a great journal to write in. I personally feel more empowered and creative when I have a nice journal. These leather journals by aLexLibris are so beautiful, my pen will probably write by itself. They remind me of old sacred texts! I have to get one! 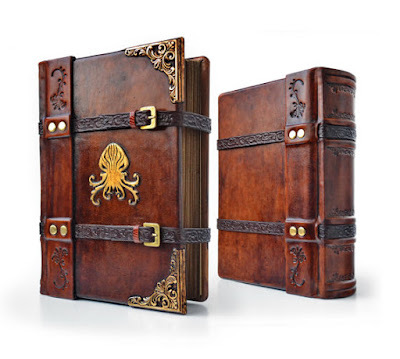 This Cthulhu Leather Journal is absolutely stunning. The metal embellishment is just gorgeous and I really love the buckles that wrap around the book. It is blank on the inside so it's perfect for writing or even as a sketchbook. The bound journal is 8 x 10.5 inches in size and has 300 pages (600 pages if you count both sides). The Cthulhu motive is hand carved on a very thick leather. I think even Lovecraft would have loved to write in something this beautiful. 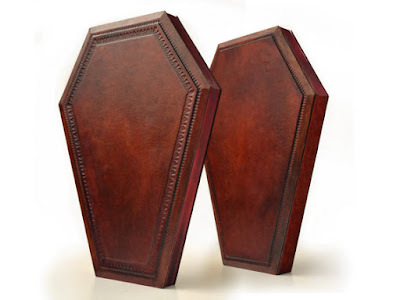 Maybe you would like something a little simpler and the Large Coffin Leather Journal would be a better fit! This is the larger of the two leather bound journals measuring 9 x 12.5 inches and holds 130 pages. The leather is a burnt reddish hue. The edges of the paper are also painted with a brown silk paint. 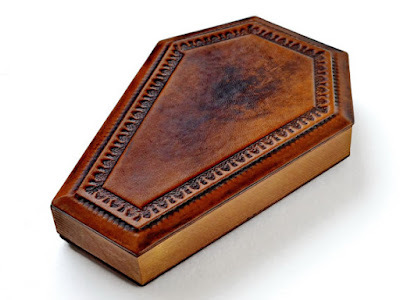 This Leather Coffin Journal is a smaller version of the one above and a slightly different color. This is an antique brown leather color and measures 8 x 5.5 inches. This journal has 200 pages. The pages have been sewn, aged, and hand tinted edges with silk moire end-papers. This would make such a cool gift for some of my writer friends or even artists! 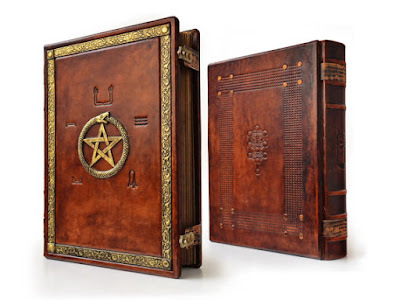 I want this Great Ankh Leather Journal so bad! This is by far my favorite and it's so gorgeous. I love the ouroboros, pentacle, and frame. The whole book is put together so beautifully. It measures 11 x 14.3 inches and has 350 pages of vintage paper. If I had this as my own, I would definitely have such a passion for writing and even drawing. Make sure to keep an eye out for any updates and new products by aLexLibris. Comment below and let me know what you think! These are awesome, right?